What is the difference between HDL vs. LDL cholesterol? What do the HDL and LDL numbers mean? What causes high "bad" (LDL) cholesterol? What foods help lower LDL (“bad”) cholesterol? Will I have to go on medication to lower my cholesterol? How can I help increase my HDL ("good") cholesterol? How can I prevent high LDL cholesterol? Cholesterol is a fat-like (lipid-like) substance that your body uses as a building block to produce hormones, vitamin D, and digestive juices that help you break down fats in your diet. HDL (high-density lipoprotein, or “good” cholesterol) and LDL (low-density lipoprotein, or “bad” cholesterol) are two types of lipoproteins that carry cholesterol to and from the body’s cells in the blood. The body needs some cholesterol to function, but when levels get too high, fatty deposits can accumulate in blood vessels, which causes them to narrow. This narrowing of the blood passageways by these lipids can lead to heart attacks, coronary artery disease, strokes, or other vascular diseases. Triglycerides are components found in body fat, and fats from the foods you eat. Triglycerides show what you have recently eaten, and cholesterol shows what you have eaten over a long period. If you eat a fatty meal, it gets absorbed as triglycerides, so in the first few days after eating a fatty meal you will have high levels of triglycerides in your blood. The liver then packages these triglycerides as fats in your adipose tissue, and turns some of it into cholesterol. This leads to high cholesterol levels in the blood for a few days to weeks after eating a fatty meal. Like cholesterol, you need some triglycerides to keep the body healthy, but increased levels can cause health problems. LDL and HDL are the two main types of cholesterol (blood fats, or lipids) that make up your total cholesterol. There is a third type of cholesterol called VLDL (very-low-density lipoproteins), which is another type of “bad” cholesterol produced in the liver, and contains a high amount of triglycerides. Your total cholesterol is the sum of the fats in your blood, which includes the LDL and HDL cholesterols. This number can give you an indication of your risk factors for developing cardiovascular disease, coronary artery disease, vascular disease, or stroke. More importantly, the amounts of each type of cholesterol are a better predictor of risk for disease than the total amount. Doctors and other health care professionals consider LDL cholesterol the “bad” cholesterol. Increased numbers of LDL cholesterol indicate more risk for blocked arteries and health problems. Doctors consider HDL cholesterol the “good” cholesterol, and they interpret its levels in the opposite manner of LDL. 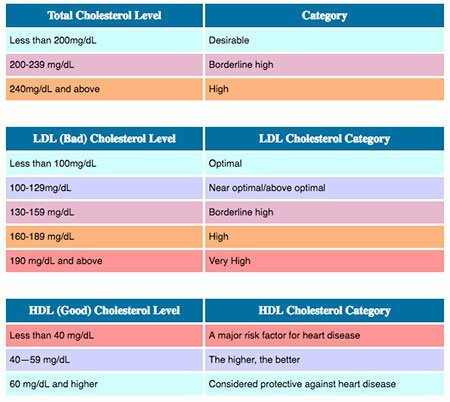 The higher your HDL cholesterol numbers, the lower your risk is for heart disease, vascular disease, and stroke. HDL cholesterol also may have a protective effect on the blood vessels, and a high level of HDL in your body may keep cardiovascular disease from developing. Triglycerides also are part of a cholesterol profile, and these numbers are more indicative of the amount of fats you have eaten recently. High triglyceride levels greatly increase your risk for developing coronary artery disease, vascular disease, and stroke. Chart courtesy of the National Institutes of Health. Cholesterol is a natural fatty substance found in the body. Since cholesterol is considered a fat, or lipid, high LDL and low HDL cholesterol levels in the blood put you at risk for stroke, heart attack, and other cardiovascular diseases. You can lower your LDL and increase your HDL levels through weight loss, regular exercise, eating a low fat heart healthy diet, and sometimes, medication like statins. The first step in lowering cholesterol is diet and exercise. Talk with your doctor, nutritionist, or other health care professional to come up with a diet and exercise plan that is right for you. Other lifestyle modifications and changes can be made to help lower your cholesterol, for example, quit smoking, reduce the amount of alcohol you drink or avoid it, and reduce stress by using stress reduction techniques like Yoga, Tai Chi, or meditation. If diet, exercise, and lifestyle changes are not enough to your lower cholesterol to healthy ranges, then your doctor may prescribe medication. The type of cholesterol lowering medication depends upon your levels of LDL, HLD, and triglycerides; and any current medications you are currently taking, and your overall health. Medication options to reduce cholesterol include statins, niacin, and fibric acid agents (fibrates). Your doctor may prescribe one or several types of these drugs to reduce your cholesterol levels to a healthy range. Raising your HDL levels by diet alone is very difficult. Your best solution to increase your HDL levels is to eat a heart-healthy diet low in fat and high in fiber. You also can help improve your HDL number if you lose weight, quit smoking, and cut out sugar out of your diet. Some statin medications may potentially increase HDL levels moderately. Discuss this treatment option with your doctor. Lifestyle and diet modifications are the main way to prevent high LDL cholesterol, and to keep a healthy level of HDL cholesterol. Eat a low fat/high fiber diet, exercise regularly, maintain a healthy weight, and do not smoke. Some risk factors for high LDL cholesterol are genetic and may require medical treatment to keep cholesterol levels in a healthy range. American Heart Association. "HDL (Good), LDL (Bad) Cholesterol and Triglycerides." Updated: Jul 05, 2017. American Heart Association. "What Your Cholesterol Numbers Mean." Updated: Jul 05, 2017. NIH; National Heart, Lung, and Blood Institute. "ATP III At-A-Glance: Quick Desk Reference." NIH; MedlinePlus. "Cholesterol Levels: What You Need to Know." Summer 2012 Issue: vol 7; no2; 6-7. Singh, VN, MD. "Low HDL Cholesterol (Hypoalphalipoproteinemia) Treatment & Management." Updated Nov 03, 2016. Please share your experience with elevated cholesterol. What foods have you found, or what foods have been recommended to you by your doctor or nutritionist to lower your LDL levels? What lifestyle changes have you made to raise your HDL, or good cholesterol number? What medications has your doctor prescribed to you to lower your LDL cholesterol levels? High cholesterol can be a dangerous condition. Take the Cholesterol Quiz to understand what high cholesterol means in terms of your health risks.